"Hackathon" was, in fact, one of Lucy Bernholz' top 10 philanthropy buzz words for 2012. TechSoup hosted one in September and our office in Warsaw, Fundacja TechSoup also hosted a hackathon this year. These are events that pair up nonprofits with good ideas and volunteer techies who can help them realize them. An example is Charity Wallet, an online tool that simplifies the online giving process for donors who support more than one organization, which was launched during the event! By the way, Lucy Bernholz' top buzz word of 2012 was "data." She maintains that we are only at the beginning of learning how to use data well for social purposes and philanthropy. TechSoup conducted a huge global cloud survey of NGOs in over 80 countries in March of 2012 and released the results in September. 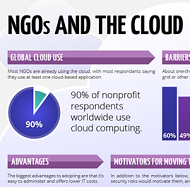 We found that NGOs are already extensively using the cloud, 90 percent of respondents worldwide indicated using some type of cloud technology. This finding largely agreed with the U.S. State of the Nonprofit Cloud survey conducted by NTEN. That preceded ours by a few months. We also found that there are barriers to deep cloud adoption among NGOs. Our survey found that lack of knowledge is the biggest barrier to additional cloud adoption, cited by 86 percent of the global respondents. Lack of knowledge was consistently reported as a barrier across geographies and organization sizes. Because data is so important, places like Connecting Up in Australian are compiling resources for using the cloud effectively like their roster of new online CRM database resources. Back in January 2012, Andrew Cohen of Forum One did his forecast of 12 Big Trends in Nonprofit Technology for 2012. Four of his first five items involved mobile phones or mobile apps. Of course charities using mobile phones is not new by any means, but in 2012 tablet computers in combination with smartphones are clearly reshaping the IT environment. Smartphone shipments exceeded those of PCs in 2011. They are the fastest spreading technology in human history. Tablets are easily the fastest growing category of portable computers. Tablet sales are expected to overtake those of all other personal computers sometime next year. Smartphone adoption in Africa is expected to roughly double in each of the next three years. And then there are the apps that power mobile devices. Laura Quinn of Idealware gave a very compelling presentation at NTC 2012: More Than Apps: Affordable Program Delivery Through Mobile Phones. NGOs are doing more and more field work using mobiles and apps that allow data to be collected and entered from anywhere. Another trend in 2012 was the fact that Microsoft expanded its software donations to foundations. The nonprofit tech landscape has two hemispheres - charities and grantmaking foundations. I think we witnessed a new trend to finally begin to join the two halves. Places like the Irvine Foundation and Carnegie Corporation have joined the nonprofit tech community, and it will be interesting. Nonprofits are really using Facebook, Twitter, and YouTube now. Many charities are successfully using Facebook for reaching out to individual donors. The average donation is up to $59. That trend has increased over the last three years. People tend to donate to a particular charity if they find friends doing it. Incorporating Twitter in fundraising campaigns is now increasing results by as many as ten times. The catch is that nonprofits must invest some effort in getting a significant Twitter following before campaigns. Social media giving took a leap this year with the recent #GivingTuesday, an online campaign to divert some of the commercial holiday frenzy toward charitable donations. #GivingTuesday happened for the first time on the first Tuesday after Thanksgiving this year and generated $10 million in donations - a 53 percent increase from donations received on the same day last year, according to the UN Foundation. Online crowdfunding platforms, like Kickstarter and Indiegogo are getting serious traction. Money raised on crowdfunding sites is estimated to be 91 percent higher than 2011. AllAfrica reported this month on a new report by the World Bank and African Development Bank called eTransform Africa that finds that information and communication technology (ICT) innovations are now clearly driving entrepreneurship and economic growth in the continent. The report finds that ICT is transforming several areas of enterprise of particular interest to NGOs including agriculture, climate change, education, health, and ICT adoption. eTransform Africa also describes the work of technology hubs or incubators across Africa such as iHub and NaiLab in Kenya, Hive CoLab, and AppLab in Uganda, Activspaces in Cameroon, BantaLabs in Senegal, Kinu in Tanzania or infoDev's mLabs in Kenya and South Africa. While this is not strictly nonprofits, charities, or NGOs, ICT for Development has long been an important mission area for the UN and many international organizations. Very heartening. If you have a nonprofit technology trend for 2012 you'd like to add, we encourage you to tell us in the comments below!